Google has now released the full change log for Android 4.1 Jelly Bean detailing all the little tweaks and tricks you can see in the latest version of Android. Jelly Bean (JB) adds a much appreciated layer of smooth coating of some of the most accessed apps and the platform in general, and this alone should have you with fingers crossed you get the update sooner. But it’s not just performance improvements - you also get improved Voice Search speaking back to you with a soft, almost natural voice and replying almost instantly. Now, that’s one area Siri can learn from. Also, Android JB introduces Google Now, a system that digs into your locations, calendar and searches to pop up cards right on your phone screen when you need them. Say, you’re passing by a restaurant you looked up earlier. Google Now will know this and it could pop up a card with its menu. We could go on and on about the new features, but it’d be best if you hit the source link below and carefully browse through all the changes - it’s worth it. 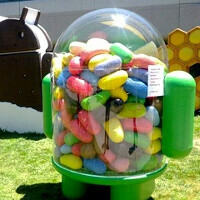 The Jelly Bean update has already arrived on our Galaxy Nexus devices, the Nexus 7 tablet has already started shipping on devices, so stay tuned for our Android 4.1 JB review soon! Wow I didn't realize that there were that many changes. Seems nice with a lot of performance based fixes. I'm not sure how the "cards" will work for Google now, since the only ones that I find useful are weather and local since I don't travel very far in a daily basis. Is there an ETA on when it is coming to the s3? Also Siri and S Voice is useless!! Google voice looks good, looking forward to it and "Project Butter"